Of the seven amendments selected by the speaker yesterday, only two were agreed by the House of Commons, to add to a "neutral" motion put by the government in the debate on exiting the European Union. This House … rejects the United Kingdom leaving the European Union without a Withdrawal Agreement and a Framework for the Future Relationship, and requires the Northern Ireland backstop to be replaced with alternative arrangements to avoid a hard border; supports leaving the European Union with a deal and would therefore support the Withdrawal Agreement subject to this change. Interestingly, parliament pulled back from a full-blown constitutional tussle that it wasn't going to win, rejecting the Cooper amendment. This aimed to make time for a private member's bill that would have had Mrs May seeking to extend the Article 50 negotiating time to the end of 2019, if there was no deal by late February. It was defeated by 321 votes to 298. 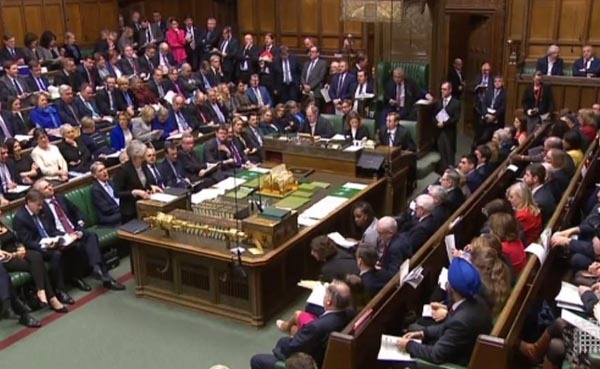 The MPs also dumped a similar amendment fronted by Labour's Rachel Reeves, which would also have required the prime minister to seek an extension to the Article 50 period if there was no deal in place by 26 February. That one lost by 322 votes to 290. To add to that, the Dominic Grieve amendment went down, 321 votes to 301, removing the chance of introducing a complicated procedural device which supposedly would have given MPs greater control over parliamentary business. Faced with just two successful amendments, therefore (one of which she supported), Mrs May used a point of order to respond, noting that, a fortnight ago, the House had "clearly rejected the proposed withdrawal agreement and political declaration, with just 202 Members voting in favour". Now, she said, the majority of MPs had said that they "would support a deal with changes to the backstop" (plus some measures to address concerns over parliament's role in the negotiation of the future relationship and commitments on workers' rights in law). It was "now clear", she declared, "that there is a route that can secure a substantial and sustainable majority in this House for leaving the EU with a deal". For Mrs May, this was a "mandate" which she could take to Brussels "and seek to obtain legally binding changes to the withdrawal agreement that deal with concerns on the backstop while guaranteeing no return to a hard border between Northern Ireland and Ireland". Nevertheless, she said, there was "limited appetite" for such a change in the EU. Negotiating it would not be easy. But, in contrast to a fortnight ago, the House had made it clear what it wanted, while also reconfirming that it did not want to leave the EU without a deal. However, simply opposing a no-deal was not enough to stop it, Mrs May added. The government would now "redouble their efforts" to get a deal that the House could support. The Withdrawal Agreement is and remains the best and only way to ensure an orderly withdrawal of the United Kingdom from the European Union. The backstop is part of the Withdrawal Agreement, and the Withdrawal Agreement is not open for re-negotiation. The December European Council conclusions are very clear on this point. This could hardly have come as a surprise. It has been the EU's consistent position forever. And, with 27 Member States having held together long enough to agree it, they were not going to re-open the book, with the risk of the discord that that might bring. And just to prove the point, the Irish government responded with alacrity to the votes and Mrs May's response to it, reiterating that the Withdrawal Agreement, including the backstop, was not open for renegotiation. The EU position, it said, "has not changed", playing back Mrs May's own words: the best way to ensure an orderly withdrawal was to ratify the Withdrawal Agreement. The thing is that there is no way that Mrs May cannot have known this. She can be under no illusions about the chances of success of her mission to Brussels. The "colleagues" are prepared to talk round the margins of the political declaration, if she can change some of her red lines, and they are prepared even to look at a request for an extension of Article 50. 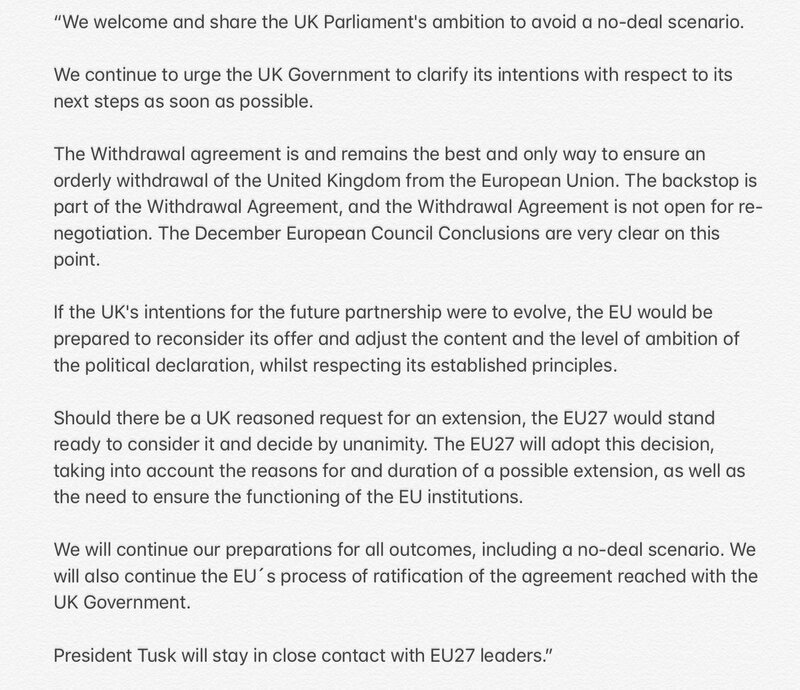 Tusk's statement actually says that the EU-27: "Would stand ready to consider it", with the rider that they would "decide by unanimity" – making it clear that we should not expect a done deal. The EU27 will adopt this decision, "taking into account the reasons for and duration of a possible extension, as well as the need to ensure the functioning of the EU institutions", he adds. Perhaps giving a clue as to why a time extension might be entertained, Tusk went on to say that: "We will continue our preparations for all outcomes, including a no-deal scenario". Clearly, many of the Member States are not ready for a "sudden death" no-deal, and even three months or so – which would not interfere with the European Parliament's plans – would help enormously. But, when all is said and done, "the EU's process of ratification of the agreement reached with the UK Government" will continue. The Withdrawal Agreement is untouchable, and Mrs May knows it. And that leaves us with a conundrum: what does Mrs May think she is doing? The Telegraph headlines that Mrs May: "wins backing from MPs to renegotiate backstop" and likes to think that she is set for a showdown with the EU. But, in her dealings with parliament, she has often proved to be quite canny. Her "play" is unlikely to be that crude. Rather, it looks as if the prime minister is playing a passive submissive game. Her ratification motion has been rejected, so she has quite deliberately gone back to parliament for instructions. With her marching orders in her pocket, she will now obediently toddle off to Brussels, where she will receive a polite but firm rejection to her request to renegotiate the backstop. She has absolutely nothing to lose by doing this. She will be following in the wake of Canute when he commanded the tide to retreat, to demonstrate to his courtiers the limits of power. Mrs May will return calmly to parliament and tell MPs how sorry she is. "I tried my best", she will say, "but the man from the European Council, he say 'no'". She might be able to sugar the pill with a few cosmetic changes to the political declaration, but her basic message to parliament will be: "over to you". The same choice then awaits them: the Withdrawal Agreement or a no-deal. But it will be parliament that makes the decision. She is but the obedient servant, doing her best to execute parliament's will. Confronted with an increasingly irritated public, who have been watching with mounting despair the games being played in Westminster, this will be when the cracks start to appear. More than a few MPs are worried about the prospect of deselection, and even the bubble walls are not thick enough to shield them entirely from the contempt that is coming their way. If some want to hold out, they can then vie for blame with the EU as to who is responsible for the no-deal disaster. Mrs May, however, can float serenely above the fray. Planning to fail may be her only way of succeeding – bringing enough MPs together to stave off the disaster, living to fight another day. Meanwhile, Mrs May has even got Jeremy Corbyn to talk to her. Having previously boycotted cross-party talks, he says that he is ready to discuss a "sensible Brexit solution that works for the whole country". You take your victories where you can get them.